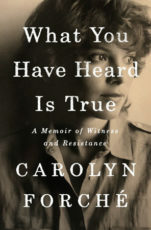 A conversation with Carolyn Forché author of What You Have Heard Is True: A Memoir of Witness and Resistance. Carolyn Forché recounts her experiences in El Salvador since the late 1970’s and during the war. Carolyn Forché is a poet, editor, translator, and activist. She is the current director of the Lannan Center for Poetics and Social Practice at Georgetown University. He is the author of many books of poetry including Blue Hour, The Angel of History, The Country Between Us, and Gathering the Tribes. In 2013, Forché received the Academy of American Poets Fellowship given for distinguished poetic achievement. In 2017, she became one of the first two poets to receive the Windham-Campbell Prize. What You Have Heard is True is a devastating, lyrical, and visionary memoir about a young woman’s brave choice to engage with horror in order to help others. It is the story of a woman’s radical act of empathy, and her fateful encounter with an intriguing man who changes the course of her life.